MT ARCHIVE: With the East Coast main line franchise awarded to Stagecoach and Virgin trains today, MT looks back at its commercial director Peter Williams' case for privatisation. The eight year, £3.3bn contract to run the East Coast main line was awarded to Stagecoach and Virgin Trains this morning (albeit with Virgin, in which Stagecoach has a 49% stake, owning a mere 10% of the joint venture), prompting the predictable outcry from Labour and the unions that a franchise that had been profitably run by a taxpayer-owned company since 2009 was being returned to private hands. The relative success of the East Coast line in that time is, of course, an argument for it staying in public hands. But naysayers might also want to read this interview with the East Coast's current commercial director Peter Williams last October, in which he argued, 'commercial businesses should be run by the private sector'. 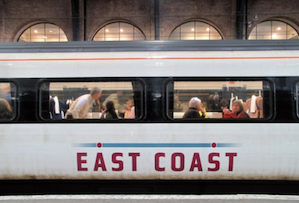 The East Coast main line is up for sale. The government is currently taking bids from train franchises to run the state-run East Coast mainline – it wants the route taken off its hands again. Eurostar has already thrown its hat in the ring, commentators are also expecting similar bids from Virgin and Stagecoach. But the whole issue has sparked a political tussle. Labour is arguing that the running of the line should remain under government control. Having already watched as the Royal Mail was wrenched from the government's grasp, it’s eager to keep the line in public hands. Last week, Directly Operated Railways (DOR) – the state-backed holding company, which has been running the line for the coalition – revealed it handed £208m to the taxpayer last year. That sounded pretty good for the Treasury; Labour’s consternation grew louder and indeed stronger. But what do the people on the inside think? Peter Williams is commercial director for East Coast, he has had a hand in the turnaround of the business, watching it go from the aftermath of National Express’ failed bid to the triumphant £208m cheque to the Treasury. ‘A lot of people will say East Coast is a model for how public sector-run companies can be successful,’ he told MT. ‘Personally, it’s quite funny sitting here watching conversations take place about what is the right thing to do. But if you look at the individuals behind DOR’s success, the management team are all from the private sector. The news that DOR was able to transfer bigger returns to the Treasury than any other train franchise has been used as further evidence that the system works – but Williams was quick to point out that DOR only has one shareholder – the government. Other franchises have to deliver returns to multiple parties. Despite his strong feelings about what should happen to the line in terms of privatisation, Williams doesn’t mind who he hands the keys over to – as long as they are up for the challenge ahead. ‘Until we end our franchise we want to make sure our foot is flat to the floor and we don’t lose momentum. The challenge for someone coming in is going to be maintaining the kind of returns we have been able to give to the Department of Transport (DoT),’ he says. No easy task we’re sure you’ll agree; especially at a time when the country’s rail industry is battling against air travel – often a faster and cheaper option (if decidedly less eco friendly). This subject is actually pretty apt when speaking with Williams. In 2011 he came under fire when it was revealed he expensed the cost of several flights between Glasgow and London (the exact route his train line takes) at a time when he was heavily marketing train travel. Well, let’s hope, for whoever does end up taking the East Coast reins from DOR, Britain’s preference steers towards trains as well.